When we skip our co-pilot function and go for the tertiary instead, we’re replacing the co-pilot with a function that fills a similar role because the tertiary and co-pilot are both either Perceiving or Judging functions. However, the tertiary has the same orientation (Introverted or Extroverted) as the dominant function. Going into a “loop” means we’re ignoring the world that is most uncomfortable for us and we’re opting to use a function that’s less mature than our co-pilot. This “loop” is going to look different for each type, but in all cases it means we’re not balanced. It also usually means that we’re avoiding personal growth. INFJs (Ni-Ti loop) and ISFJs (Si-Ti loop) share Extroverted Feeling (Fe) as their co-pilot and Introverted Thinking (Ti) as their tertiary function. When they go into an unhealthy loop, they bypass their Fe in favor of Ti, which has the same inner-world orientation as their dominant Introverted Intuition (Ni) or Introverted Sensing (Si). Skipping over Fe in favor of Ti lets IxFJ types stay in their favorite world — the one inside their own heads — when using their judging function. They’ll become more analytical than normal, and more focused on trying to organize things logically. They may become fascinated by certain topics and spend hours researching everything about them. INFJs and ISFJs who spend too much time in an Ni-Ti or Si-Ti loop can start to loose touch with their diplomatic, relational side. They may withdraw from people and become critical of others’ ideas. They’re often very defensive of their own ideas (which, since Ti is immature, aren’t always well-developed or accurate). IxFJs in the loop typically isolate themselves and are more rigid and/or hostile than normal. ENFPs (Ne-Te loop) and ESFPs (Se-Te loop) share Introverted Feeling (Fi) as their co-pilot and Extroverted Thinking (Te) as their tertiary function. When they go into an unhealthy loop, they bypass their Fi in favor of Te, which has the same outer-world orientation as their dominant Extroverted Intuition (Ne) or Extroverted Sensing (Se). Avoiding Fi and using Te as their decision-making function instead lets ExFP types stay in the outer world, which is their preference. When they’re relying too heavily on their immature Te, ENFPs and ESFPs can become very blunt and tactless. They try to apply objective logic to their decision and interactions, but because Te isn’t one of their strongest functions they often overestimate the accuracy and efficiency of their arguments. Staying in an Ne-Te or Se-Te loop cuts ENFPs and ESFPs off from the part of their personality that helps them line-up with their deeply held internal value structure. They can start to lose touch with their authentic self and may say or do things that seem out of character. In particular, they may become more argumentative and less patient with others than usual. INTJs (Ni-Fi loop) and ISTJs (Si-Fi loop) share Extroverted Thinking (Te) as their co-pilot and Introverted Feeling (Fi) as their tertiary function. When they go into an unhealthy loop, they bypass their Te in favor of Fi, which has the same inner-world orientation as their dominant Introverted Intuition (Ni) or Introverted Sensing (Si). When INTJs and ISTJs start using Fi instead of Te, it lets them stay in the more comfortable inner world when using their judging function. Fi isn’t a well-developed function for them, though, and being in the loop can undermine their typical objectivity. This function gives them a strong set of values, but when they’re not balancing it out with Te they can express those values in a hostile and/or unhealthy way. Since Fi helps IxTJs develop their own, very personal, value system being in a loop can make them feel like they need to defend those values or as if their value system is the only one that matters. IxTJs in an Ni-Fi or Si-Fi loop often become withdraw, self-righteous and judgmental, especially if they’re going through stress. They can also become hypercritical of other’s values and beliefs. ENTPs (Ne-Fe loop) and ESTPs (Se-Fe loop) share Introverted Thinking (Ti) as their co-pilot and Extroverted Feeling (Fe) as their tertiary function. When they go into an unhealthy loop, they bypass their Ti in favor of Fe, which has the same outer-world orientation as their dominant Extroverted Intuition (Ne) or Extroverted Sensing (Se). Using their Fe instead of Ti lets ExTPs stay in their preferred world — the outer world of people, ideas, and activities — when they’re using their decision-making function. They may become irritated that Fe lets them pick up on other people’s emotions and opinions. Immature ENTPs and ESTPs might also use this ability to manipulate people, especially if they’re not balancing out their Fe with their more responsible Ti side. When in an Ne-Fe or Se-Fe loop, ENTPs and ESTPs might become more emotionally expressive, which is not always a good thing. They might loose touch with their objectivity and make rash, emotion-based decisions. They can also easily fall into the temptation of manipulating others to get a desired outcome or reaction, sometimes just to amuse themselves. INFPs (Fi-Si loop) and INTPs (Ti-Si loop) share Extroverted Intuition (Ne) as their co-pilot and Introverted Sensing (Si) as their tertiary function. When they go into an unhealthy loop, they bypass their Ne in favor of Si, which has the same inner-world orientation as their dominant Introverted Feeling (Fi) or Introverted Thinking (Ti). When an INxP type goes to Si instead of Ne as their learning function, it lets them stay in their preferred inner world. Instead of exploring possibilities, they start to focus more on their past experiences. When they spend too much time in a loop, this reliance on their unreliable Si can start to hold them back. INFPs and INTPs in an Fi-Si or Ti-Si loop have a complicated relationship with real-world details. They might be hyper-attentive to such details, then completely ignore them. They’ll want verifiable, sensory facts but might struggle to process them. They can also become caught-up in the past. They might struggle to process past mistakes or to move forward into the future. ENFJs (Fe-Se loop) and ENTJs (Te-Se loop) share Introverted Intuition (Ni) as their co-pilot and Extroverted Sensing (Se) as their tertiary function. When they go into an unhealthy loop, they bypass their Ni in favor of Se, which has the same outer-world orientation as their dominant Extroverted Feeling (Fe) or Extroverted Thinking (Te). When ENxJ types loop, they ignore their Ni and try to use their less-developed Se instead. This lets them stay in the outer world, which they prefer, when using their perceiving function. Because it’s not a mature function for them, ENFJs and ENTJs in the loop can get too caught-up in outer world experiences. In an Fe-Se or Te-Se loop, ENFJs and ENTJs can easily become distracted by irrelevant details in the outer world. They can also become self-indulgent and/or impulsive. They may get distracted from their more long-term goals and start to live-in-the-moment, focus more on their physical appearance, and place too much value on how others see them. ISFPs (Fi-Ni loop) and ISTPs (Ti-Ni loop) share Extroverted Sensing (Se) as their co-pilot and Introverted Intuition (Ni) as their tertiary function. When they go into an unhealthy loop, they bypass their Se in favor of Ni, which has the same inner-world orientation as their dominant Introverted Feeling (Fi) or Introverted Thinking (Ti). When an ISxP type goes to Ni instead of Se as their learning function, it lets them stay in their preferred inner world. Rather than experiencing the outer world, they’ll turn inward and become more interested in predictions, possibilities, and patterns. Ni isn’t well-developed for these types, though, and focusing on it too much isn’t healthy. ISFPs and ISTPs in an Fi-Ni or Ti-Ni loop can get stuck in the idea of possibilities or tied to an unrealistic vision. They may waffle back and forth between relying too much on hunches or ignoring them entirely. More rarely, they may start to lose touch with what’s real/realistic, even ignoring their own physical needs. ESFJs (Fe-Ne loop) and ESTJs (Te-Ne loop) share Introverted Sensing (Si) as their co-pilot and Extroverted Intuition (Ne) as their tertiary function. When they go into an unhealthy loop, they bypass their Si in favor of Ne, which has the same outer-world orientation as their dominant Extroverted Feeling (Fe) or Extroverted Thinking (Te). When ESxJ types loop, they ignore their Si and try to stay in their preferred outer world by using Ne instead. This gives them a perceiving function that might feel more comfortable, but it’s immature and not very reliable on its own. When they rely on this function too much, ESFJs and ESTJs can lose their sense of groundedness and practicality. ESFJs and ESTJs in a Fe-Ne or Te-Ne loop they become much more interested in exploring possibilities. That’s not necessarily a bad thing, but they can very easily become overwhelmed by everything that could happen or all the ways they can interpret something. Without Si to balance out Ne, ESxJs can become paralyzed not knowing which option to take. They can also become paranoid, jump to conclusions, and misinterpret new information. 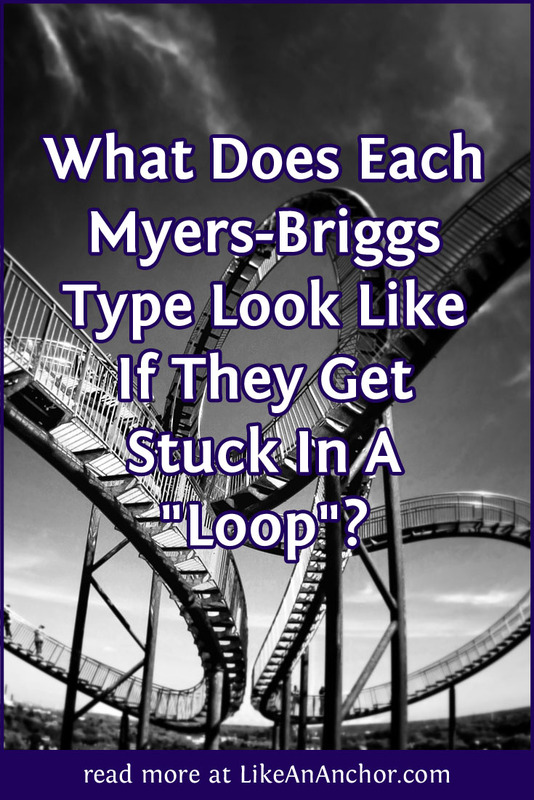 So there you have it — the ways each personality type reacts when they’re in a loop. Please keep in mind that in this article we’re talking about an unhealthy use of our tertiary functions. These descriptions will be more actuate of a stress-out or unhealthy example of each type; not of a well-balanced individual in their everyday life.